Having become a semi-learned student of the airline rules, I wield them like constitutional rights. Last year I chose to become an APP (my designation for the 25,000 plus mile status) on two airlines: United and American. The former is part of the OneWorld network, and the latter is a member of Star Alliance. Since my home bases are Montclair, NJ – 10 miles from Newark Airport – and Los Angeles, the most convenient airline for me to fly in the US is United, which has the Newark-based hub of its recent mergee, Continental. American sometimes flies out of Newark, but more frequently its NY flights originate in and go to JFK and LaGuardia, making it a second choice for me. However, the Star Alliance has more airline partners than OneWorld, and they fly to many more destinations, so I’m glad to have at least the APP-1 (more than Any Passenger and less than Any Passenger Plus) benefits. 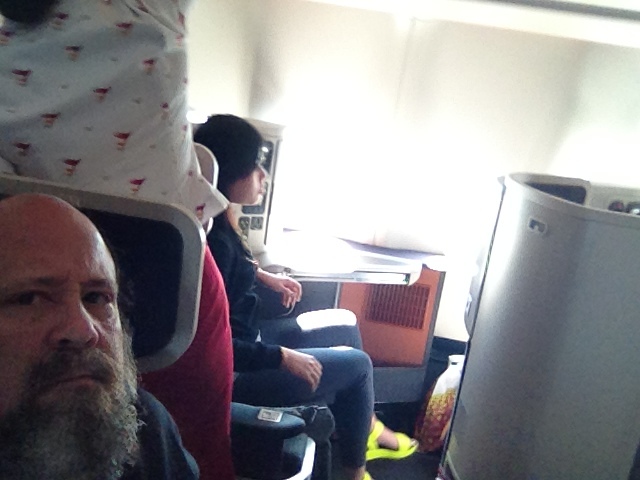 I write this blog now aboard a flight from Melbourne, Australia to Hong Kong. I am traveling with my husband/business partner Curt. We are videotaping for a corporate client in both locations. The decision to do the shoot happened late in the game, so arrangements were made last minute, when few flights were still available. The only feasible and affordable option required traveling with Cathay Pacific from JFK to Hong Kong, then Hong Kong to Adelaide, Australia, then Adelaide to Melbourne, where we worked for three days. This flight goes from Melbourne directly to Hong Kong, where we will stay for two nights. The next leg is to San Francisco, where we will work for a day. The last segment will take us from San Francisco back to Newark. Cathay Pacific is a Star Alliance member. With our American gold status, we are classified as Ruby travelers on Star Alliance, going through the first and business class check-in and security lines, and boarding earlier in the game than other passengers. Since the economy class tickets had been sold out for the eastward bound flights at the late time of our booking, we purchased the next level: premium economy. That gave us a little more room and an APP+ status. But here is how being a partner airline APP member served as an advantage: The flight from NY to Hong Kong was 15 hours; the one from Hong Kong to Adelaide was another 9. When we arrived in Hong Kong, a ticket agent was waiting for us, informing us that we had been upgraded to business class. With open seats on the plane, priority went to us instead of others who had bought premium economy tickets since we had a combination of those slightly more expensive tickets and APP status on another Star Alliance partner airline. Business seats on these eastern airlines are amazing for a number of reasons, but best of all, the seats fold down flat like beds. As someone who has a hard time sleeping in planes, I slept more than half of the journey, waking up refreshed enough to work for the afternoon in Melbourne. It made a huge difference! The seats en route back west are only economy. But because of our APP status with Star Alliance member American, Cathay Pacific was able to offer us bulkhead seats, ie, front row in economy, with unlimited leg room. For non-ruby passengers, these seats would have cost an additional $100 each, but our status ensured we could get them, and at no extra charge. We have reserved the same seats for the trip from Hong Kong to San Francisco. The last leg of our trip will be provided by United, enabling us to return on a direct flight to Newark Airport. Checking over the seat availability, it seems we will be doomed to the last row. But as APP members, we stand a chance of getting upgraded, if anything is available. I am well aware of the disadvantage of accruing miles in more than one airline per year. By this year’s end, I will have accumulated just short of 100,000 miles on all my flights combined. Had I stuck with one airline or partnership and taken a few extra trips to reach that mile marker, I would have been a lifetime status holder. Instead, the status I’ve earned over the last 10 months – which in another three weeks will be APPP on United and APP on American – will be good only through 2013. Come January 1, I will have to start all over again for 2014. But the offerings didn’t leave me much of a choice. The flights that gave me the most miles were available at specific times on particular airlines. At least I will enjoy my status in the coming year, always keeping an eye on changing rules and new opportunities. This entry was posted on October 12, 2012 at 11:02 am and is filed under Business Video, Corporate Video Production, Informational Video, Marketing Video, Nonprofit video, Tips, Uncategorized, video production, Web Video. You can follow any responses to this entry through the RSS 2.0 feed. You can leave a response, or trackback from your own site.